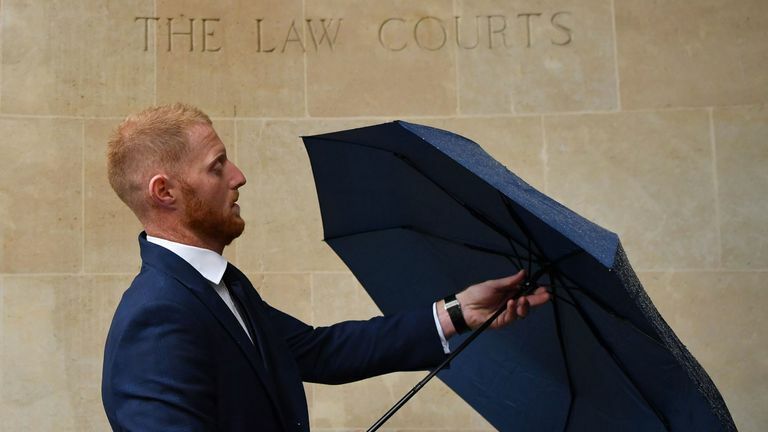 Ben Stokes has been accused of lying over alleged homophobic abuse directed towards a gay couple on the night of his arrest outside a Bristol bar. The England cricketer finished giving evidence on Friday at his trial for affray, during which he was forced to deny he had acted as "an angry man" who had "lost control". His defence has been built around the claim that he wanted to defend a gay couple who were receiving "homophobic abuse" from Ryan Hale and Ryan Ali - who Stokes allegedly knocked unconscious. Stokes told the jury he stepped in after telling the men to stop, but that he had "significant memory blackout" about exactly what they had said to the couple. All three men were charged with affray over September's incident, but on Thursday judge Peter Blair directed the jury at Bristol Crown Court to find Mr Hale not guilty. The lawyer for Ali - who suffered multiple eye injuries after the altercation - told Stokes he was refusing to "take responsibility". Anna Midgley said Stokes had "hit Mr Ali when he was backing away and threatening no violence", but the Durham all-rounder claimed he was told to "f*** off or I'll bottle you". Stokes, 27, admitted throwing punches, which Ali told the court had left him with a head injury that affected his memory of the night. But Stokes insisted he was acting in self-defence and denied suggestions from prosecutor Nicholas Corsellis that he had anger issues. He also denied being drunk at the time of the incident, but told the jury he would have had at least 10 drinks on the night. Among them would have been a bottle of beer after England's match against the West Indies, two or three pints at the team hotel, and five or six vodka and lemonades while out in Bristol. He also recalls "potentially" having some Jagerbombs in the Mbargo nightclub. The court was shown CCTV during the cross-examination of Stokes, with one clip appearing to show him flicking a cigarette at the gay couple, William O'Connor and Kai Barry. Another showed him walking away from the club, in which Stokes said he was "looking at the night's sky" and talking to God. Mr Corsellis told him he was lying to the jury. He said: "You are not telling the truth to this jury. You are lying to the jury about the cigarette. And about the mimicking and mocking (of Mr O'Connor and Mr Barry)." In another piece of CCTV, Stokes' England team-mate Alex Hales could be heard shouting "stop" and "he's had enough" as the scrap developed. Mr Corsellis described him as "an angry man", who had "lost all control", and was "aggressive, demeaning and looking for a fight" - a claim again denied by Stokes. Co-accused Ryan Ali also gave evidence on Friday afternoon. He said he had been out to celebrate with "best friend" Ryan Hale, who had been promoted at work. Ali told the jury he would have had six or seven Jack Daniels and Coke before leaving the club. He described "banter" between him, Mr Hale and the two gay men as they walked away from the club. "I recall we were in a group of four, having a laugh and having some banter and the next thing I remember is having a tall blond man charging towards me," said Ali. He said he told the man he did not want any trouble and backed away, palms open "trying to retreat". "At that point, I recall seeing Ryan to my right-hand side, unconscious on the floor," said Ali. He claimed Stokes had turned his back and that he seized that opportunity to protect his friend: "I used my right arm around his neck and my left arm to grab his left hand so I could pull him against me to try to restrain him." When asked why he thought Stokes had charged towards him, Ali suggested "he was very angry and looking for someone to pick on". CCTV also showed Ali moving towards Alex Hales with a bottle, before taking a swing at Mr Barry. He told the jury he did not remember the incident or why he had taken such action. "I am perceiving a significant threat, I might be on my own, Mr Barry is on my right-hand side and I didn't know who it was... I have a hand in my face," he said. He denied a suggestion by the prosecutor that the use of the bottle "was wholly uncalled for". Stokes, of Castle Eden, Durham, denies the charge of affray, as does Ali, of Forest Road, Bristol. The trial continues on Monday with closing speeches from lawyers.